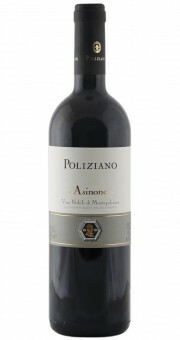 Der Poliziano Asinone Vino Nobile di Montepulciano präsentiert sich in einem satten Purpur mit violetten Reflexen und fast schwarzen Kern. Über dem Glas verbreitet er einen schönen Duft mit Anklängen von dunklen Beerenfrüchten, Schwarzkirschen, Pflaumen, feiner Würze, etwas Feigenkonfitüre, Rumtopffrüchte sowie auch dezent frisches Leder, Lakritz und Tabak. Am Gaumen zeigt der Wein sich sehr saftig mit guter Fruchtbetonung, einem harmonischen Ausdruck durch feinziselierte, eingebundene Tannine und einer satten Dichte. Die Vollmundigkeit nimmt er mit bis in das lange Finale mit einem sehr angenehmen Röstnotenansatz. To be released in the first quarter of 2018, the 2015 Vino Nobile di Montepulciano Asinone is a bright and energetic red wine. This Sangiovese-based red offers volume and richness spread over dark fruit, cherry and blackberry flavors. This was a warm vintage, and you get extra softness, fruitiness and succulence as a result. In the mouth, it shows depth and persistence. The tannins still need a year or two to find optimal integration, so it's worth waiting just a bit longer. 94/10 Punkte Wine Enthusiast: Wild red berry, tilled soil, violet, new leather and a whiff of sandalwood slowly unfold on this fragrant red. The structured savory palate delivers dried black cherry, pomegranate, white pepper and clove framed in polished, fine-grained tannins. A hint of coffee lingers on the close. Drink 2020–2025. 93/100 Punkte Wine Spectator: A modern style, offering bright cherry and berry fruit wrapped in a warm embrace of vanilla and toast notes. Iron, leather and earth accents add depth as this cruises to a long finish. Best from 2021 through 2033. 3,500 cases made. 92/10 Punkte James Suckling: Blackberries and stones in the nose follow through to a medium body and firm, silky tannins that have a chewy edge. Medium finish. Needs time to soften. Better in 2020.